Now made with premium, clear, locally harvested Poplar wood (effective for all orders placed after 3/4/18)! This means minimal-to-no knots and beautiful, smooth, furniture grade wood that looks great on its own but takes paint extremely well. *Most pictures are shown in our original knotty pine, please refer to the picture labeled "Poplar Wood" for actual wood tones and grain quality. Make your toddler's transition from crib to toddler bed simple and fun! 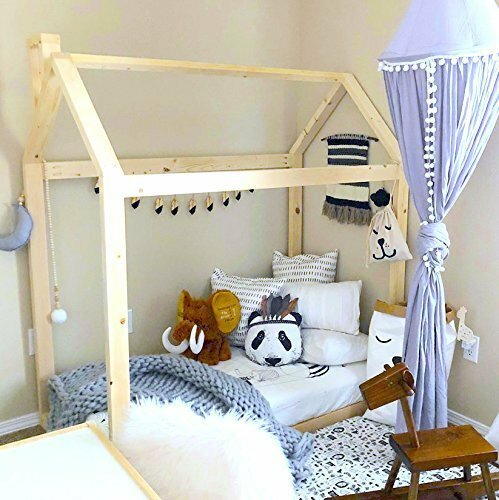 This adorable little toddler bed is in the shape of a simple house frame, which I believe is a comforting staple of architecture. There are custom options available for this item, such as a chimney, slats, even a picket fence! Fits a standard crib mattress and comes with all necessary hardware and very simple instructions. The bed comes as "ready to paint/stain/coat", I do not offer this service because of shipping and time restrictions. They are very easy to paint with a 4" roller and about a quart or 2 of paint, and they take a stain/clear coat very well. Stands 60" tall. The item will come as raw, untreated premium grade Poplar wood (effective for orders placed after 3/4/18). Tools required for assembly can all be found at any hardware store. You will need a #1 and #2 square bit (longer style), an extra set of hands (although I've done this myself many times), and a common household power drill (nothing fancy). If you can put together a bookshelf from Walmart this shouldn't be difficult! If you have any questions about this product by The Pinned Purveyor, contact us by completing and submitting the form below. If you are looking for a specif part number, please include it with your message.